He’s right. Sequestration is incredibly irrational, not only failing to distinguish good programs from bad, but imposing its cuts in a blind, disproportionately painful manner. Sequestration exists because in 2011, House Republicans threatened to wreak havoc upon the world economy unless President Obama made large ideological concessions. Unable to resolve the hostage standoff, the two sides agreed to impose large, across-the-board cuts, sparing both the main programs of the welfare state and avoiding any revenue increase. The idea was to force some eventual agreement between the two sides that would replace sequestration with a mix of cuts to retirement programs and closing tax deductions. But, after Obama won reelection, Republicans decided as a party to embrace sequestration as its preferred policy – or, at least, as preferable to any negotiated budget deal with Obama. Part of this campaign involved mocking Obama’s argument that sequestration was terrible policy. 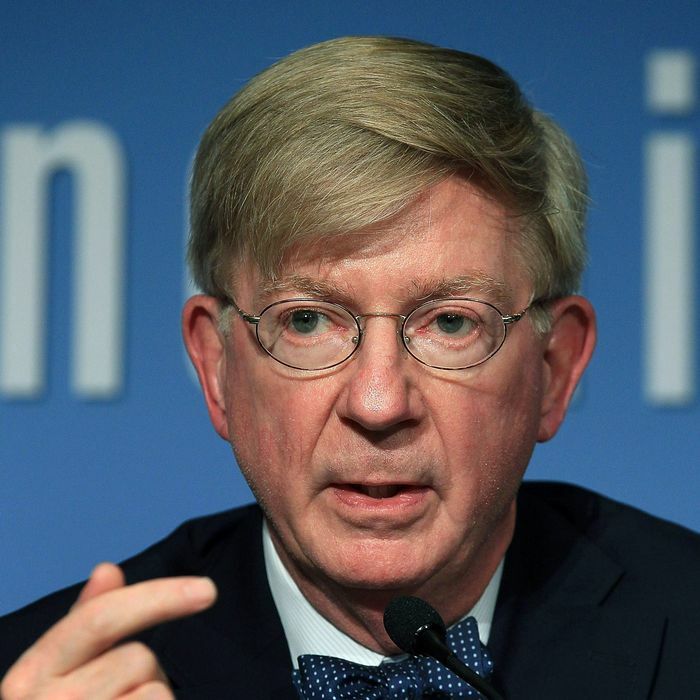 A key figure in this campaign was George F. Will. The thing is, this is still the Republican line. The premise of sequestration was that it would make a deal possible, because imposing badly designed cuts to programs both parties generally like – remember, the federal programs Republicans most want to cut are exempt – created a positive sum incentive for negotiation. Obama has offered such a compromise, but Republicans dismissed it without offering any compromise of their own. There are lots and lots of potential ways the two sides could make a deal to end sequestration, but Republicans won’t entertain any of them. The only strategies under consideration involve using threats to extract unilateral concessions from Obama. The notion of actually trading something with the president remains completely verboten among conservatives. Will’s column does not acknowledge any of these things – the GOP’s embrace of sequestration, let alone his own sneering at the prospect that sequestration might do any harm. The only line in it even hinting at who readers ought to blame for the sorry state of affairs he describes is that it’s Obama’s fault: “beginning with the indiscriminate and ineffective 2009 stimulus, government has incited indiscriminate hostility to public spending.” Ah, so the hostility is “indiscriminate,” but Obama “incited” it by passing a law to fill in half the output gap and prevent a depression. If you’re conceding that your own position amounts to “intentional irrationality” and “indiscriminate hostility to public spending,” maybe you should actually, you know, admit that.